London’s Southbank, the historical Bermondsey, used to be a pretty rundown area of former wharfs and warehouses. Severely bombed during World War II, its renaissance begun 60 years ago with the Festival of Britain, the Festival Hall, the world famous concert hall, now the only reminder of what was a very successful short term project. Sir Michael Cain and Tommy Steele were born in the area. It stretches from what was once was County Hall to Tower Bridge. Today it is vibrant and plays host to the London Eye, the National Film Theatre, Shakespeare’s Globe, the resurrected Oxo building plus City Hall, the oddly named headquarters of the Greater London Authority. Ken Livingstone, the previous Mayor, titled it thus in a thwarted bid to take over the square mile which is the real City of London. Bermondsey is home to many other famous and interesting buildings too, including Her Majesty’s Ship Belfast. HMS Belfast, permanently moored in the Pool of London, opposite The Tower, is the largest currently preserved former Royal Navy vessel. It is in fact a light cruiser, and not a battleship or major aircraft carrier, and says something for the way Great Britain looks after its waterborne heritage. In the United States the final class of big battlewagons has been grabbed by the sponsoring States and sit massively as a memorial to a glorious past. 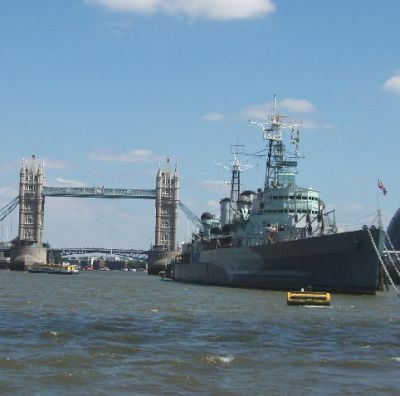 In truth London and the Thames should be proud of HMS Belfast, a proud World War II warrior, built at Harland and Woolf in the city it is named after, launched on St Patrick’s Day 1938 and a veteran of the Arctic convoys to the Soviet Union during 1943. She played an important role in the Battle of North Cape, assisting in the destruction of the German warship Scharnhorst and was involved in the D Day landings. 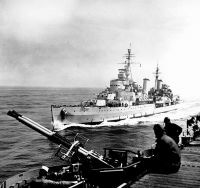 Belfast saw further combat action in 1950-52 during the Korean War. In retirement she was acquired by the Belfast Trust and opened to the public in 1971 and is now part of the Imperial War Museum (IWM). Today she is one of London’s most popular tourist attractions with around 250,000 visitors per year. She is popular with schools, who can easily manage the ship and nearby IWM in a day. Very educational. Also used for conferences BAE Systems recently chose the ship for its recent media briefing on its Regional Aircraft activities. 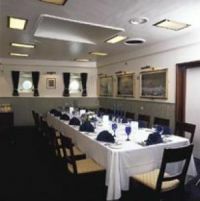 Private rooms are available for functions including the Wardroom. When Belfast was first opened to the public, visitors were limited to the upper decks and forward superstructure. Today nine decks are open to the public. Access to the ship is via a walkway. The official guidebook to HMS Belfast divides the ship into three broad sections. The first of these, 'Life on board the ship', focuses on the experience of serving at sea. Restored compartments, some populated with dressed figures, illustrate the crew's living conditions and the ship's various facilities such as the sick bay, galley, laundry, chapel, mess decks and NAAFI. The second section, 'The inner workings', below the waterline and protected by the ship's armoured belt, contains core mechanical, electrical and communication systems. As well as the engine and boiler rooms, other compartments include the transmitting station (housing the ship's Admiralty Fire Control Table, a mechanical computer), the forward steering position and one of Belfast's six-inch shell rooms and magazines. The third section, 'Action stations', includes the upper deck and forward superstructure with the ship's armament, fire control, and command facilities. Areas open to the public include the operations room, Admiral's bridge and gun direction platform. 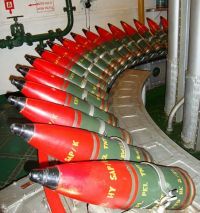 To emphasise the range of the ship's armament, the forward six-inch guns of A and B Turrets are aimed at the London Gateway service area on the M1 motorway, some 12½ miles away on the outskirts of London. One of the 4-inch gun mounts and a 4-inch shell hoist are kept in working order for use during blank-firing demonstrations by the Wavy Navy re-enactment group. The group also stage recreations of wartime activities, such as the battle of North Cape. 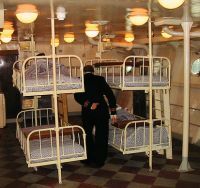 In 2002 Belfast introduced 'Kip in a Ship', allowing school and youth groups to stay onboard Belfast overnight, sleeping in bunks on a restored mess deck. At £38 per night it includes bed but no breakfast! In addition to the various areas of the ship open to visitors, some compartments have been fitted out as dedicated exhibition space. Permanent exhibitions include 'HMS Belfast in War and Peace' and 'Life at Sea'. From time to time current warships berth alongside, and also cruise ships. The ship’s relationship with Russia remains to this day. Two of the ship’s badly corroded masts were re-manufactured at the Severnaya Verf shipyard near St Petersburg, with financial support from Russian businessmen. On 19 October 2010 the new masts were unveiled at a dedication ceremony attended by HMS Belfast veterans, Prince Phillip and officials from the Russian Embassy and Government. 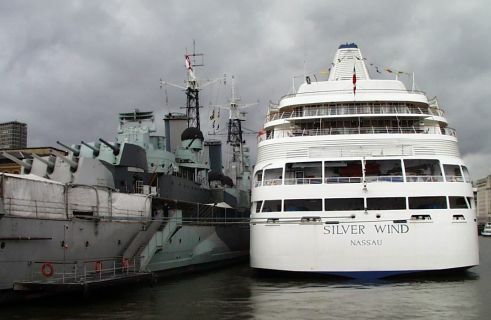 Getting to HMS Belfast could not be easier. Either take the splendid riverside walk or find your way to London Bridge Station. Hays Wharf, once exactly what it says, but now an up market shopping and restaurant area, is well sign posted and beyond that sits Belfast. Also very close by is The Shard, destined to become the tallest building in Europe when completed next year. Within its structure the London Shangri-La is being fitted out.